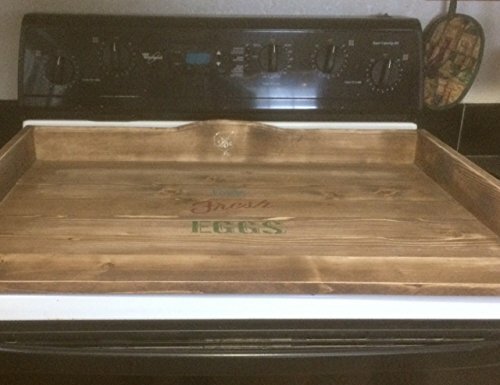 This stove top cover noodle board has several functions. Add extra counter space to your kitchen or use it for entertaining your guests! It is made of pine, and measures 21.5" x 29.5" x 3". It has been stained and hand painted, with a matte clear coat. The bottom of the tray is a super smooth finish, with clear coat, and a coating of acrylic. There are black metal fleur de lis type handles on the sides. This board is not intended for putting food directly on it, since it has stain and lacquer. If you have any questions about this product by LodgeDecorNMore, contact us by completing and submitting the form below. If you are looking for a specif part number, please include it with your message.